Coco coir makes an excellent planting medium for hydroponic gardens due to its excellent moisture holding ability and inert characteristics. Coconut coir is produced from the brown husk that surrounds the coconut shell. It is composed of millions of tiny micro-sponges, which absorb and hold up to eight times their weight in water. It is a sturdy substance, lasting three times as long as peat moss. Coco is a great addition to the hydroponics arsenal! This is just one brick reconstituted with a gallon of water. 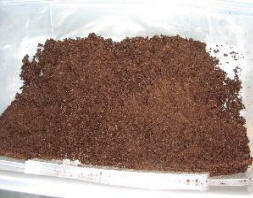 Coconut coir is also called Palm peat, coco, or just coir. Some brand names are: Ultrapeat, Cocopeat, and Coco-tek. Advantages: Superior water retention and aeration, overall a great hydroponic medium. Disadvantages: Breaks down after several uses; doesn't drain quite as well as others. For this reason, it is often mixed with other media to improve drainage. 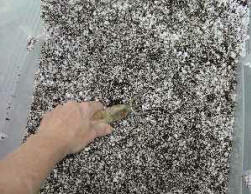 You can mix coconut coir 50-50 with perlite to improve drainage, or put a layer of perlite on the bottom of the growing bed before adding the coconut medium. This is coco mixed 50/50 with perlite. A super all-around potting mix for your hydroponic garden. Coco-Coir is good for: drip systems, dutch buckets and auto pots. Not as good for ebb and flow, as it can be washed away. I put LECA balls in the bottom of my E&F pots to prevent this. Works great.